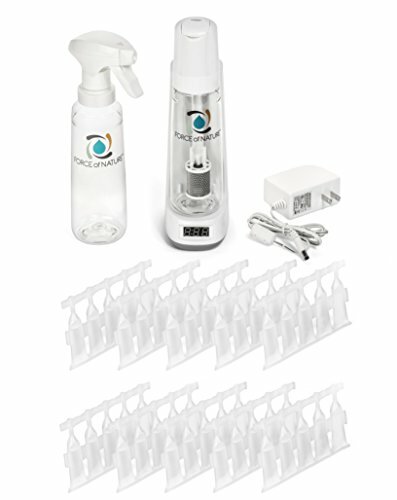 Force of Nature Non-Toxic Natural All-Purpose Cleaner/Deodorizer Holiday Bundle Kit is a small appliance that allows you to create electrolyzed water, an all-purpose cleaner and deodorizer made from salt, water & vinegar, right on your countertop. Electrolyzed water is commonly used in the industrial space (for example in hospitals) for its safety, efficacy, & low cost per ounce. BEST VALUE: Contains 50 capsules, enough for a full year supply of non-toxic cleaning. Saves up to 80% per ounce vs the leading natural cleaner brands. If you have any questions about this product by Force of Nature, contact us by completing and submitting the form below. If you are looking for a specif part number, please include it with your message.